The wife & I went to the Perry swap meet yesterday (Macon GA Area). The pickins' were EXTREMELY thin for Pontiac guys. If you were looking for SBC parts you were in the right place but almost nothing for the Pontiac crowd. Only a handful of T/A parts. I did find a guy with three(3) 8" snowflakes for $60. After taking a real close look at them; One had been badly damaged by the wrong lug nuts and the holes were too far beyond repair for my liking, one had far too much curb rash that I felt would make it nearly impossible to make it look "decent". I also wasn't too interested in carrying three 'flakes the thirty minute walk to the car. I convinced the guy to sell me the only good one for $25. After carrying the 'flake for a while I purchased some rope and hung it off my shoulder. Seems a guy carrying a snowflake is a big advertisement for every Pontiac guy to come and say hello. Everyone I spoke to was disappointed with the qty. 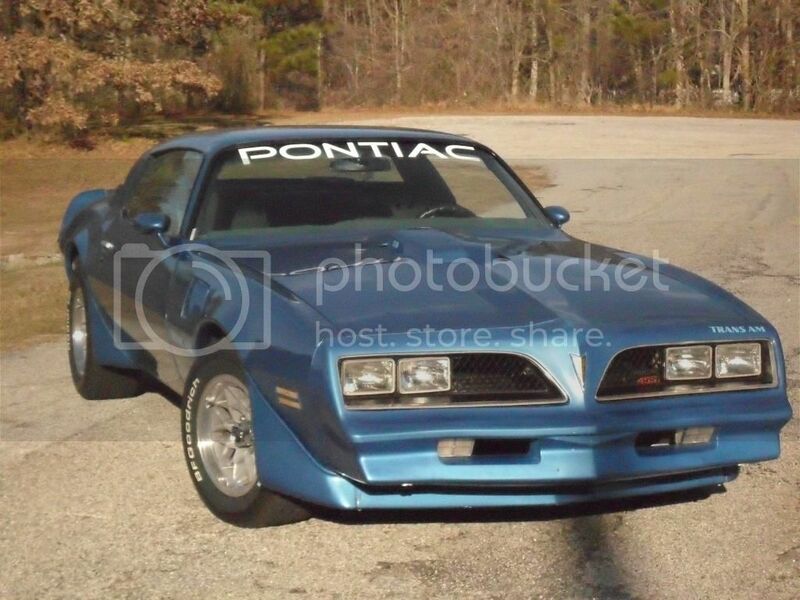 of Pontiac parts available. One guy was looking for a replacement fender flare for his '75 T/A and this was definitely not the place to find one. He is planning to attend Moultrie next week to find what he's looking for. The Moultrie GA Swap Meet is supposed to be the biggest car swap meet event in the Southeast. It's an annual event and is being held next weekend. My car is basically done, but I wouldn't mind finding a couple real nice fenders as spares or to replace my left fender which had a patch piece welded in. I've never been to Moultrie and it's a long ride at 3+ hours to walk around and pay $10 for a burger. Anyone else going? While Moultrie is a huge show, don't be surprised if you are disappointed again at the lack of Pontiac parts. Chevy and Mustang are plentiful but each time I have gone I was looking for either Buick or Pontiac parts and was let down by the lack of both. You never know, some vendor may show up with a boatload. I will be there next weekend. 73 Formula, LS6.0, 4L60e trans, Moser 12 bolt with 3:42 gears, full PTFB GT suspension. Chevy motor is best motor. "Take care of the equipment, and the equipment will take care of you." I went to swap meets all over the southwest and east and no matter how "large" and "big" they were, there were next to NO Pontiac parts out there. What you'd find is there may have been a few out there but they get hit up by some larger buyer who buys everything they have while they are setting up and then leaves, leading to no Pontiac parts anywhere. I don't even bother going to shows or swap meets and haven't for a few years now. No point. I don't even bother going to shows or swap meets and haven't for a few years now. No point. I don't think there's any point in going to the Moultrie GA event for me. I really don't "NEED" anything and if I did I could probably: 1) Save the gas money of at least a tank of gas to make the trip ($40+) 2.) Save all the time on the road driving as my time is worth something ($10hr driving = $80) AND PUT THAT MONEY TOWARD A LOCAL, TAC, OR Evil-Bay purchase.... I'll come out far ahead that way. NOTE: There were some vendors there with non-division specific GM parts I did grab. One guy had a zillion different kinds of hardware and I grabbed a bunch of window reveal molding metal clips, at 5 for $1 that was a great deal and they're impossible to find at any of the auto parts stores. I also got a couple handfuls of SS interior panel screws for just a couple dollars. One of the tool guys was selling Craftsman tools cheap and I got a few new screwdrivers as well @ $3 ea. The 8" snowflake was a pretty good deal at $25 even though I'll spend a ton of time making it look presentable. Like you, I don't see any real benefit in traveling to the "BIG" swap meets far from home looking for Pontiac parts but I will probably still go to those that don't require a large outlay of gas & time. It still has a little bit of a fun factor checking out all the CHEBY stuff. Got to go,Just to see all the Sites, I have been able to come across some rare literature at Moultrie , I enjoy just looking at everything, I agree if you are going just for Pontiac parts it might be a let down, But always run into people I haven't seen in a while and I guess I just like to see the Car Corral . We picked up a few parts there but nothing of much significance...we usually can find a nice car or two but we didn't buy one this time. The rain really messed that up. And forget the hamburger..get the alligator kabobs! Best event food anywhere!! !